The big Coronal Hole on the sun is back again. And could spark strong geomagnetic storms and Arctic auroras as it is turning toward Earth again. At the end of October, a hole in the sun’s atmosphere lashed Earth’s magnetic field with solar wind, sparking moderately-strong geomagnetic storms and almost a full week of Arctic auroras. Now, It’s back. 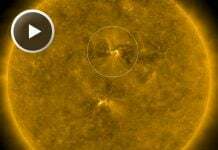 And this same “coronal hole” is turning toward Earth again. 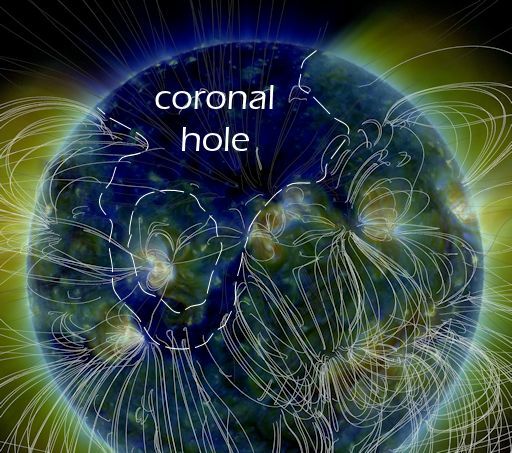 Coronal holes are regions in the sun’s atmosphere where the magnetic field peels back and allows solar wind to escape. 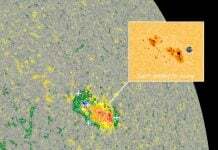 Since our last encounter with this giant hole in late October it has been transiting the farside of the sun. Now that it is back we can see that the hole is not quite as large as it was a month ago. But it is still impressive, covering more than 1/4th of the visible solar disk. 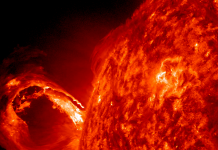 NOAA forecasters expect the leading edge of the emerging solar wind stream to reach Earth late on Nov. 22nd. G1-class geomagnetic storms are expected on Nov. 23rd. Keep your eyes to the sky.